[Thanks for entering! The giveaway is now over.] Are you having a hard time deciding what to do with your significant other for a date night? The Hush Experience has you covered. The company is built upon creating memorable and unique experiences for couples via pop-up date night dinner parties. That includes an exclusive prix fixe menu by a local chef, live entertainment, cocktails, and the hush of a secret rendezvous point which isn't known to guests until 48 hours before the night of the event. That even includes theme! Does it sound like you want that kind of excitement in your life? If so, good. Read on! With Valentine's Day around the corner, it only makes sense that Hush Experience would be formulating a pop-up for then. That Friday night, February 13th, you can be a part of their AFTER DARK event which I honestly cannot tell you any other details about; even I don't know! What I do know is that Duc and I will be giving it a try ourselves (by invitation) to see just what magical pop-up date night Hush Experience is able to conjure up. 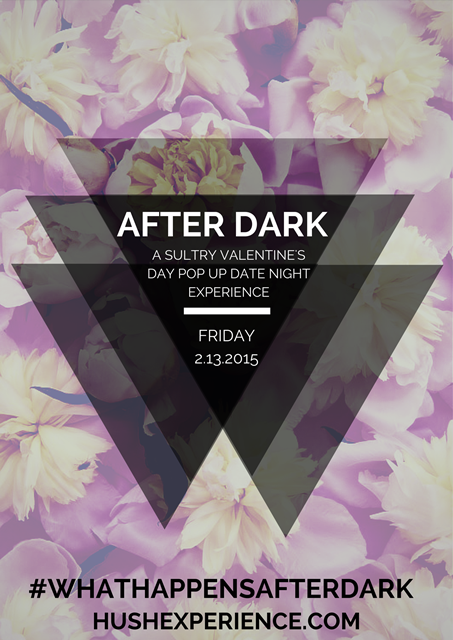 No worries - you can join us in figuring out #WhatHappensAfterDark as well. Hush Experience has graciously given Much Ado About Fooding readers two options to get in on this secret event. You can enter below to win one pair of tickets (valued at $300) to AFTER DARK or you can jump the gun and reserve your seats before it sells out! Head on over to http://hushexperience.ticketleap.com/afterdark/details to read more about AFTER DARK and then click on Tickets to purchase. By entering in the code "MuchAdoAboutFoodingVIP," you can get a whopping 50% off the current ticket price (reduced price is $150/couple). This special code lasts until February 5th! So...what are you waiting for? a Rafflecopter giveaway The giveaway will run until 01/31/15 at 11:59pm PST. Winner will be contacted upon winning and has 48 hours to respond before a runner-up winner is drawn.